Senegal’s Amadou Diagne is already well-known in his country for his wonderful percussion playing with the National Band. On this debut album we get to hear the other side of this versatile musician. On “Introducing Amadou Diagne”, we are treated to his own compositions and songs featuring Amadou’s guitar work and vocals. The album has a simple, direct style as if he is sitting opposite a few feet away, acoustic guitar in hand delivering a private performance. Amadou’s voice is a breathy tenor with a plaintive edge and quivers with feeling. There’s an honesty to this music and its delivery that hits home, regardless of whether you understand the words or not, although I wish I did! Besides Amadou’s voice and understated guitar work delivered with mantra-like repetition, there is also some tasteful accompaniment from kora (Sura Susso), cello (Beth Porter), sax (George Chilcott), double bass (Miranda Sykes), talking drum, shakers, djembe and other traditional drums and Susso’s harmonies subtley placed underneath. Amadou was born into a traditional griot family and trained as a percussionist since the age of 4. His upbringing as a percussionist are evident in his treatment of rhythm and ebb and flow both in his melodies and on his guitar. At times I found myself drawing parallels with the late John Martyn in the trance-like nature of the compositions (eg on “Yaro”) and the ability to transfer the listener out of the physical realm. "charming, generous, a joy to listen to"
The whole album has a lovely laid-back feel, bluesy in tone and a very natural, intimate and peaceful delivery, although he also doesn’t shy away from dealing with the issues of Africa’s conflicts on “Africa Stop War” (with Ivory Coast and Somalia much in mind). Although I have not heard Amadou play guitar live I have seen him perform as a percussionist (as part of Julaba Kunda*) and I can testify that in person he is very charming, a generous musician and a joy to listen to. This is an album of intimacy and subtlety by an artist of humility and integrity. 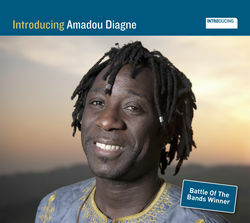 “Introducing Amadou Diagne” (INTRO115CD) was released by World Music Network on 27th February 2012.